Whooper Swan photographed in Hokkaido, Japan during the winter of 2010. This is the same species that winters in the UK. 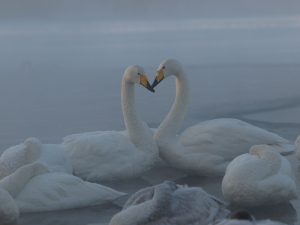 In the UK the Whooper Swans return to Iceland to Breed. The swan here will return to the East Russian tundra to breed. UK Whooper swans winter in Norfolk, South Glos, North West England and Scotland - and probably else where.